116th Street runs from Riverside Drive, overlooking the Hudson River, to the East River, through the New York City borough of Manhattan. It traverses the neighborhoods of Morningside Heights, Harlem, and Spanish Harlem; the street is interrupted between Morningside Heights and Harlem by Morningside Park. The western entrance to 116th Street at Riverside Drive is flanked by a pair of white apartment buildings with curved facades, The Colosseum and The Paterno. The New York Times has said that the "opposing curves, (form) a gateway as impressive as any publicly built arch or plaza in New York. The unusual curves of the road are the result of an 1897 plan to make the land between Claremont Avenue and Riverside Drive into a public park in order to give veterans parades a large park adjacent to Grant's Tomb as a terminus. The street was redesigned so that a vehicle or a parade coming up Riverside Drive would swing onto 116th Street in a gracious curve, then immediately swing north onto Claremont Avenue following a second curve. The city never appropriated funds to buy the land, but the curves remain. The top of The Paterno is capped with an architectural fancy masking a water tower in a shape that conjures up a section of Mansard roof, complete with dormer window. It is visible from the gates of Columbia University at Broadway and 116th Street. 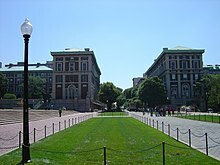 The intersection of 116th Street and Broadway, is the location of the main entrance of Columbia University, the city's Ivy League school. Until the 1950s, the street ran uninterrupted through Morningside Heights from Riverside Drive to Morningside Park. In 1953, during Dwight D. Eisenhower's presidency at Columbia, however, the block between Broadway and Amsterdam Avenue was permanently closed to vehicular traffic and was turned into a pedestrian way called "College Walk." The street had been ceded to Columbia in exchange for a payment of $1,000. The street is again interrupted where it meets Morningside Drive, this time by the steep downward slope of Morningside Park. The main, east-west thoroughfare portion of 116th Street begins at the eastern edge of Morningside Park and runs east through central Harlem. A large West African immigrant community has developed in central Harlem with stores, bakeries and cafés along 116th Street west of St. Nicholas Avenue. This community has been called Little Senegal or Le Petit Senegal. At Lenox Ave., the street runs past the Malcolm Shabazz Mosque, formerly the Mosque No. 7. The building was erected as the Lenox Casino. 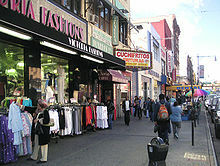 East of Fifth Avenue, 116th Street has historically been the primary business hub of Spanish Harlem. From Lexington Avenue to First Avenue, the street is lined with businesses selling food, clothing, and other specialty and ethnically specific goods to a Spanish-speaking clientele. East 116th Street terminates at FDR Drive, the site of the East River Plaza, a retail mall complex with large commercial tenants Costco, Aldi's and Target. The future 116th Street will serve the N, ​Q, and ​R trains at Second Avenue when constructed. The M116 New York City Bus route also stops on the street. Looking west from Morningside Drive; Morningside Park is behind the camera. Carl Schurz statue at the 116th Street overlook at Morningside Park. Morningside Avenue, east side of the park. 115th Street buildings in background. 116th Street at Eighth Avenue in Harlem, and the uptown entrance to 116th Street station (A, ​B, and ​C trains). West African stores between Adam Clayton Powell Jr. Boulevard and Eighth Avenue in Harlem. Malcolm Shabazz Mosque, 116th and Lenox Avenue. El Barrio, 116th Street between Third Avenue and Lexington Avenue. Wikimedia Commons has media related to 116th Street (Manhattan). ^ Gray, Christopher, Streetscapes/The Colosseum and the Paterno, 116th Street and Riverside Drive; At Curves in the Road, 2 Unusually Shaped Buildings ", The New York Times, August 15, 1999. ^ Gray, Christopher. "Streetscapes/The Colosseum and the Paterno, 116th Street and Riverside Drive; At Curves in the Road, 2 Unusually Shaped Buildings", The New York Times, August 15, 1999. ^ "COLUMBIA PUTTING NEW WALK IN SHAPE; Transformation of 116th Street Block Into a Campus Artery Moving Toward Completion", The New York Times, November 17, 1953. Accessed August 21, 2008. ^ Attah, Ayesha. "Mourides Celebrate 19 Years in North America", The African. Accessed October 23, 2007. "116th Street in Harlem, New York is aptly named Le Petit Senegal. It abounds in aromas of stewing mafe and yassa wafting out of restaurants, sidewalks turned into mosques and businesses stocked with merchandise right out of Dakar." ^ Norval White and Elliot Willensky, AIA Guide to New York City, Fourth Edition, 2000, p. 494. ^ "East River Plaza | PlanNYC", Accessed August 25, 2009. Archived 2009-09-03. ^ "Squeezing Big-Box Retailing Into Small City Spaces", The New York Times, June 11, 2008. Accessed August 25, 2009.